Prospect Lawn Cemetery, in Hamburg, New York, provides a historic and beautifully tranquil final resting place for your loved ones. Situated on 18.5 acres, Prospect Lawn has the honor of providing internments for over six thousand individuals. Prospect Lawn is a non-sectarian cemetery. 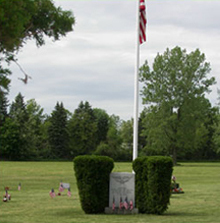 Among our burials there are over three hundred veterans interred throughout the cemetery. Flags are placed on each of these graves on Memorial Day. We have veterans from each war and conflict starting with the Revolutionary War through the current conflicts in Iraq and Afghanistan. 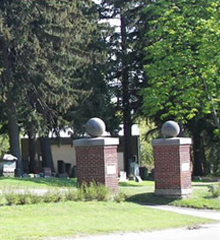 With 5,000 gravesites available, Prospect Lawn Cemetery will continue to serve the burial needs of the people in Western New York for many years to come. The cemetery is organized under the New York State Not-For-Profit Law. We are regulated by the New York State Division of Cemeteries, which is a division of the NYS Office of the Secretary of State. We welcome donations to the cemetery. Your generosity is greatly appreciated. General Information:The cemetery is in two parts: East and West. East has about 6,000 burials (see map on next page) and has no graves available. The burials located in East are recorded on Ancestry dot com. West has many grave sites available. We offer two types of gravesite: Full graves and cremation graves. We do not permit scattering of ashes in the cemetery. We welcome pre-need arrangements. Please call our office (716-646-3630) to make an appointment.